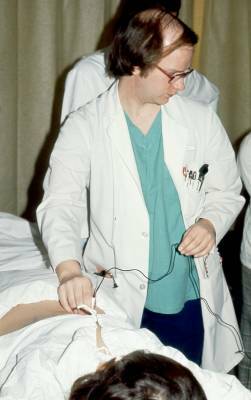 Some of the earliest efforts involving the use of ultrasound for guidance of renal biopsy procedures took place at the Bowman Gray School of Medicine Ultrasound Laboratory in 1974 and 1975. 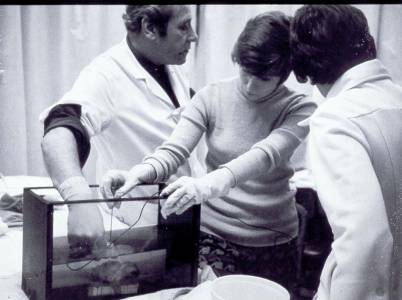 The photograph below shows Dr. Abdel Mohsen Nomeir, medical student Patty Potter and Pat Nuss, R.N. 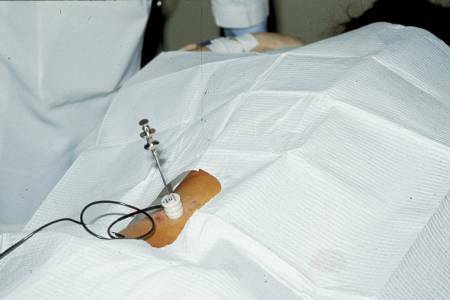 using a-mode ultrasound to scan a cadaver kidney in a water tank while advancing a biopsy needle into the kidney through a specially designed ultrasound transducer with a central opening through which the needle could be advanced. The composite image (below, right) shows the relationship of the kidney boundaries and needle tip and the "spikes" on the a-mode ultrasound image. A few months later the technique was applied clinically with good result. Can anyone help me identify the medical resident in the photograph (below left)? I think his first name may have been Durwood. Notice the biopsy needle in place through the central aperture in the a-mode transducer. 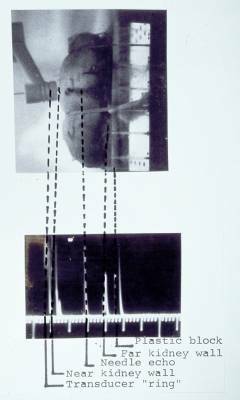 Later transducer designs made use of a slot rather than a "hole" so that the transducer could be removed or replaced as needed during the procedure.